Canon Digital IXUS i digital camera introduction : Canon, a leader in photographic and imaging technology, today releases the Digital IXUS i zoom / Powershot SD30. Building on the Digital IXUS i 5 performance and chic design, the Digital IXUS i zoom adds a 2.4x optical zoom and embraces the perpetual curve design of its big brother, the Digital IXUS i. The sleek and compact Digital IXUS i zoom comes with 5.0 Megapixels and DIGIC II processing for high image quality and a USB 2.0 Hi-Speed interface for fast transfer speeds. The supplied Camera Station allows for easy connectivity to the PC, printer and television - perfect for viewing contemporary slide shows created by the camera. The Camera Station also charges the camera when docked. The Digital IXUS i zoom is available in an array of striking colours: Jet (Black), Sahara (Gold), Cranberry (Red) and Ultra-violet. A silky finish completes the look and feel of this ultimate digital accessory. A first for Digital IXUS i cameras, the Digital IXUS i zoom now features a 2.4x (f/3.2 - f/5.4) optical zoom, with a high contrast Ultra High Refractive Index Aspherical lens for sharp results in a slim package. When combined with digital zoom, the Digital IXUS i zoom delivers 10x magnification. IXUS i - Sleek, stylish, better : The Canon IXUS i zoom's 5.0 Megapixel sensor delivers the image quality required for printing up to A3 photo prints. The new focusing system is both faster and more power efficient, making the auto focus more responsive and helping to extend the number of shots possible before charging the battery. The Digital IXUS i zoom maintains its small size whilst improving the user's shooting and reviewing experience with the larger 1.8" LCD monitor. Improvements in the user interface include larger animated icons and the addition of a world time zone display. The menu can also be displayed in 22 different languages. Canon IXUS i - A clever Camera Station : For fast and convenient charging, printing, downloading and connection to televisions and home cinema systems, the Canon Digital IXUS i zoom comes complete with a Camera Station (CS-DC1). The station acts as a dock, or cradle, for the camera, ensuring quick and easy connectivity without having to attach and reattach multiple cables. The supplied wireless controller allows the docked camera's playback to be operated remotely. 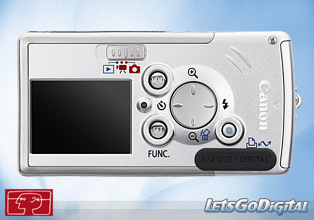 This allows the new slideshow and playback features on the Canon IXUS i zoom to be controlled from the comfort from the user's sofa when sharing photos and movies on television screens. When connected to both a direct printer and TV, users can view their images and use the print menu on screen to edit then print. The DIGIC II processor ensures that the images recorded have superb colour quality, as well as giving the camera improved performance overall. 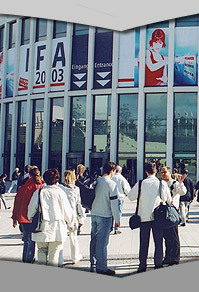 iSAPS technology assesses the scene and adjusts the camera settings to achieve the optimum results. For rapid transfer of images, the Canon Digital i zoom utilises a USB 2.0 Hi-Speed interface. The Digital IXUS i zoom features 9-point AiAF to keep even off-centre subjects sharply in focus. With 16 different shooting modes, the camera's settings are optimised for a wide range of situations. A selection can be made from Auto, Manual, Macro, Portrait, Landscape and Night Snapshot modes, or from the Scene Modes which now include an underwater setting, allowing users to take advantage of the optional All Weather Case (AW-DC40 - waterproof to 3 metres). With the addition of My Colors, users of the Digital IXUS i zoom can become more creative in their digital photography. Special effects such as Color Swap or Custom Colors can be performed in camera while shooting both stills and movies. Previously, this level of image enhancement was only possible after downloading to a PC, and using special software. Canon Digital IXUS i / SD30 camera - Intelligent Orientation Sensor : The Digital IXUS i zoom incorporates an Intelligent Orientation Sensor that automatically rotates images for review, regardless of the orientation of the camera. The sensor also activates the FUNC/SET button at the rear of the camera to act as the shutter release when it detects that the camera is in the vertical orientation. This allows the operator to shoot stills in portrait orientation, using one hand, whilst maintaining camera balance. Users can record movies with sound up to 1 GB or 60 minutes long, whichever is reached first. Digital zoom can be used whilst shooting. As well as being able to select from VGA and QVGA (at 10fps and 20fps respectively), the Compact Movie mode (QQVGA / 15fps) is designed to make sharing movies via email as simple as possible. Digital IXUS i digital camera - Printing images : When used in combination with Canon's new Compact Photo Printer SELPHY CP710 and Canon's Ink and Paper Set (KP-108IP), prints can be produced for just 30 . With its optional Rechargeable Battery Pack (NB-CP2L), the euro cents each Compact Photo Printer SELPHY CP710 is highly portable, just like the compact Digital IXUS i zoom, making them ideal partners. Printing via a SELPHY CP Compact Photo Printer also allows the user to print handy ID prints and movie prints. When connected to the latest range of PictBridge compatible PIXMA printers (also released today) image enhancement is possible with functions including Noise Reduction and Vivid Photo, as well as the new Face Brightener feature. Printing of images without having to connect to a PC is also made simpler via the Print/Share button, which also acts as an easy upload button for Windows XP & Mac OS X.
Canon IXUS i camera - Comprehensive software : The Digital IXUS i zoom comes bundled with the following Canon Software: ZoomBrowser EX 5.5, PhotoRecord 2.2 (Windows), ImageBrowser 5.5 (Macintosh): For easy image download, storage and retrieval, as well as management of image layout and printing. PhotoStitch 3.1: Creates stunning panoramas and can be used with Windows and Macintosh. Movie Edit Task: For easy editing and enhancement of movie footage recorded on the Digital IXUS i zoom and easily accessed through ZoomBrowser and ImageBrowser. Also included is ArcSoft PhotoStudio photo manipulation software. 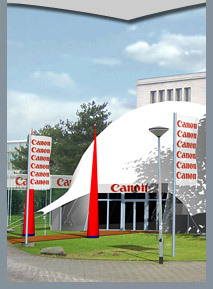 Purchasers of the Digital IXUS i zoom are eligible for membership of CANON , which offers 100 MB of online space for uploading and sharing iMAGE GATEWAY images. Membership also allows users to download start-up images and sounds to customise their My Camera settings. The bundled software supports Windows 98 (SE), ME, 2000 (SP4), XP (SP1/3) and Macintosh OS X v10.2-v10.3. The Digital IXUS i zoom supports PTP for driverless transfer to supported Windows XP or Macintosh OS X systems. Canon Digital IXUS i / Powershot SD30 digital camera - Accessories : A range of accessories is available to complement the Digital IXUS i zoom. Accessories include an All-Weather Case (AW-DC40), High Power Flash (HF-DC1), Compact Power Adapter (CA-DC20E), Battery Charger (CB-2LVE), and the Digital IXUS Metal Strap. The Digital IXUS i zoom is compatible with SD and MMC Memory Cards, and comes complete with a 16 MB SD Memory Card.